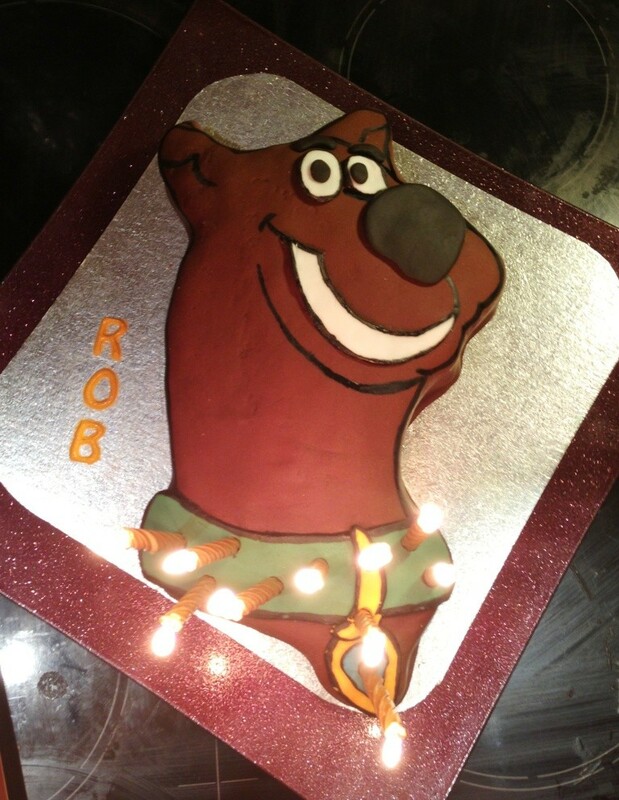 Happy birthday to my Rob! 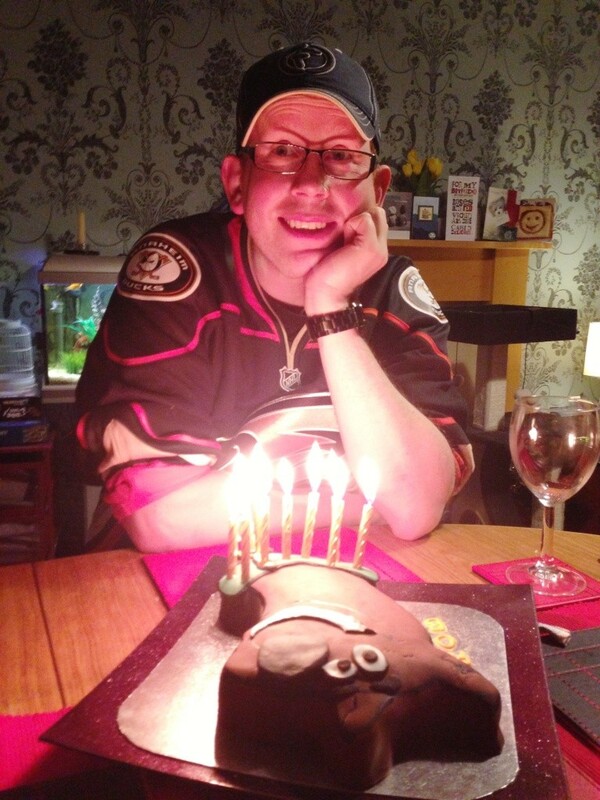 Can you believe it’s a year ago since I made his guitar birthday cake? Doesn’t time fly…! 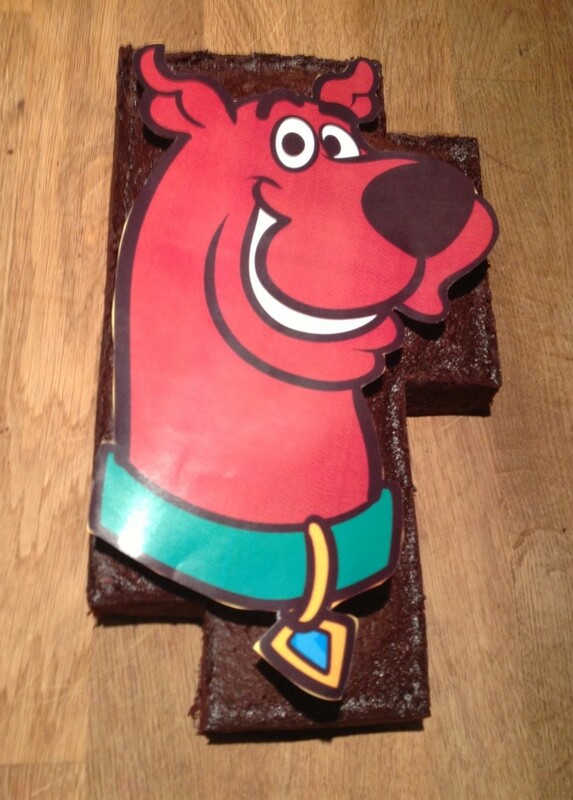 Scooby Doo is his favourite cartoon character, and I’d planned and stocked up on chocolate fondant before we went away, knowing it’d have to be a quick turn around as soon as we got back. 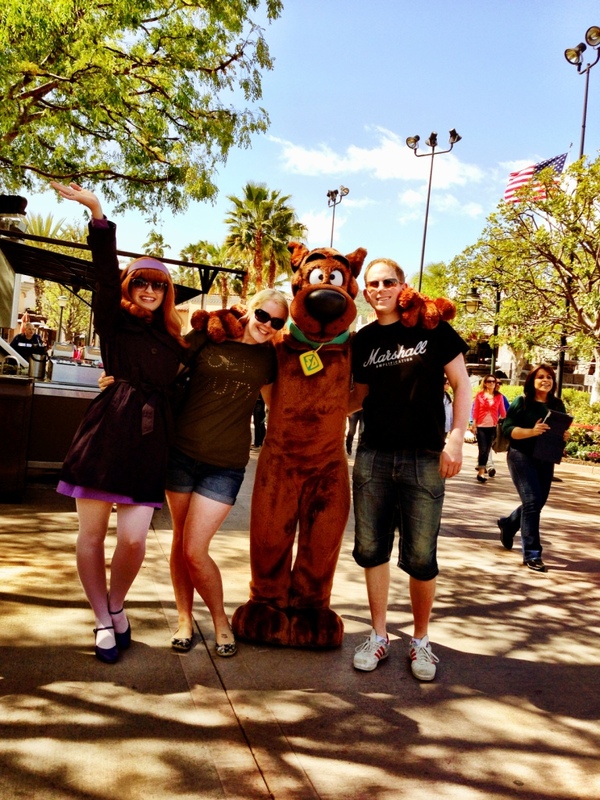 As luck would have it (honestly I didn’t even think he was part of their brand), WHO did we meet at Universal Studios whilst we were in LA last week?? 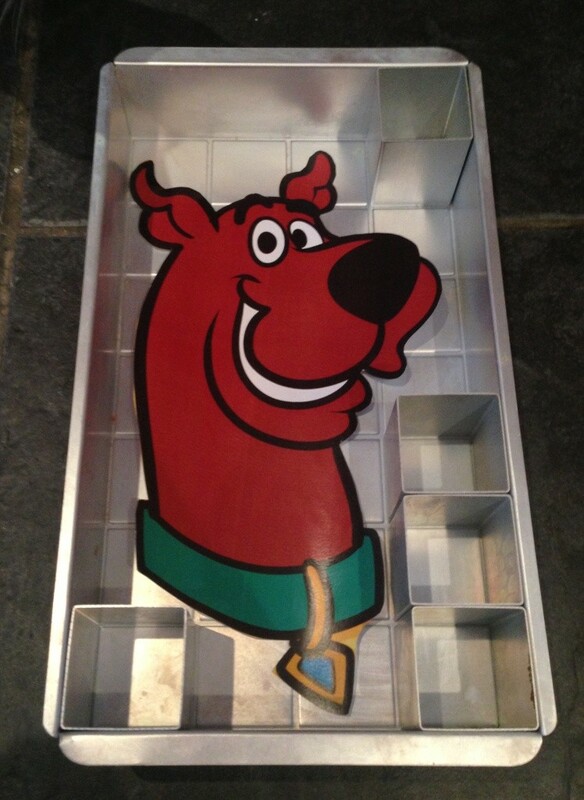 Wilton make some lovely Scooby Doo pans that I’m sure make life much easier, but I’d searched and searched around and couldn’t find one either to buy or rent for under about £20. Given my love for trying things new and not wanting to repeat cakes, I decided that really was too much to spend. So – I set about my own way of doing it! With a simple template, I found the image online, printed it, and cut it out. I also printed a mirror image so I could flip it over and press through the detail where needed. 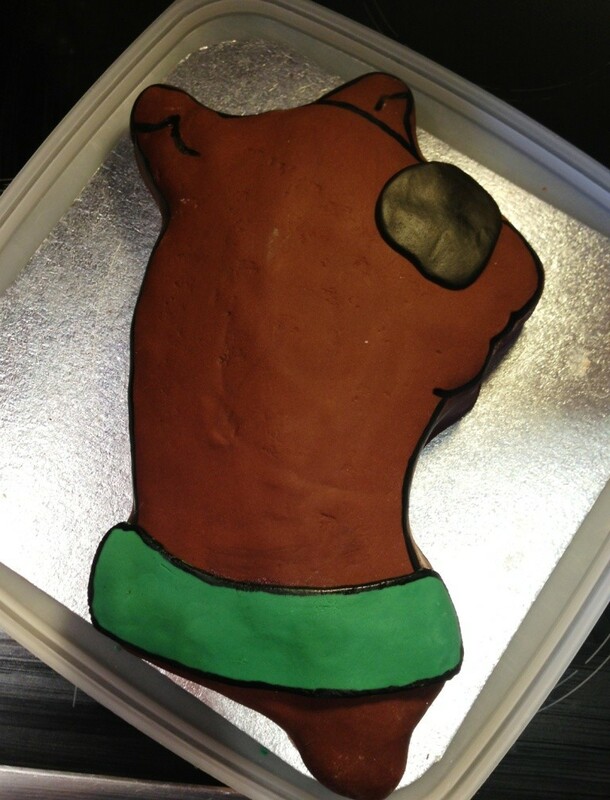 I wanted the cake itself to be quite sturdy, as it had to hold shape when trimmed and cut. 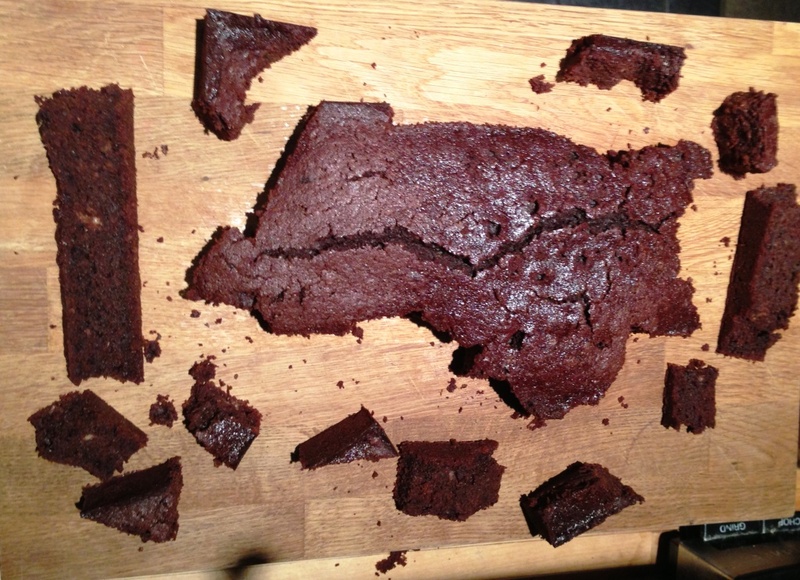 Normal victoria sponge just wouldn’t be up to this – so I used this chocolate pound cake recipe from the BBC. It was straightforward, easy to follow. 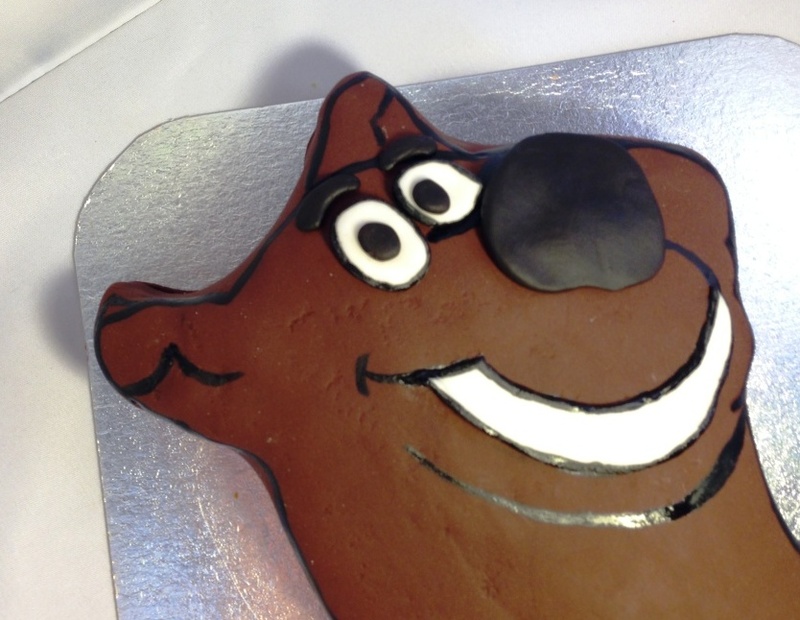 To get the cake into shape, I started with an oversized rectangular shape, my alphabet and number tin. After placing the template inside, I blocked off any squares that were completely outside the shape, so as not to waste too much cake. Once completely cool, I put the template back on top and carefully trimmed into shape, with a sharp serrated knife. 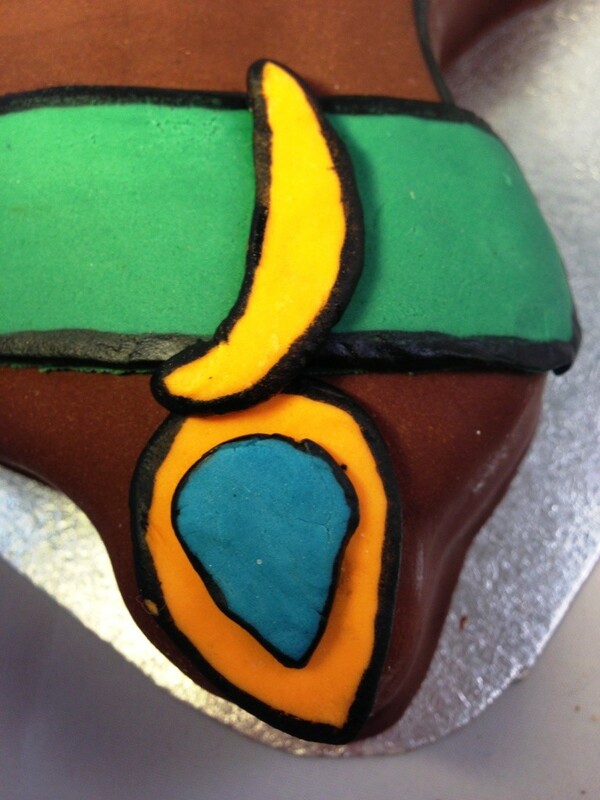 Can you guess what it is yet…?! Next up, to retain moisture, and give the icing a good base to stick to, I added a layer of chocolate buttercream, being sure to get in all the corners and nooks and crannies. Once smoothed out, the cake went into the fridge for at least half an hour, so the icing could firm up, and wouldn’t squish all over the place when it was iced. Finally it was time to start the details. To create the black cartoon edging, I simply took a fine paintbrush, and very carefully painted on the lines with black gel food colouring. It did take quite some time, and needed a day to dry, but was so effective. Finished details on the collar, complete with dog tag! For the eyes and mouth, I used some white fondant (plus a little extra black for those googly eyeballs!) 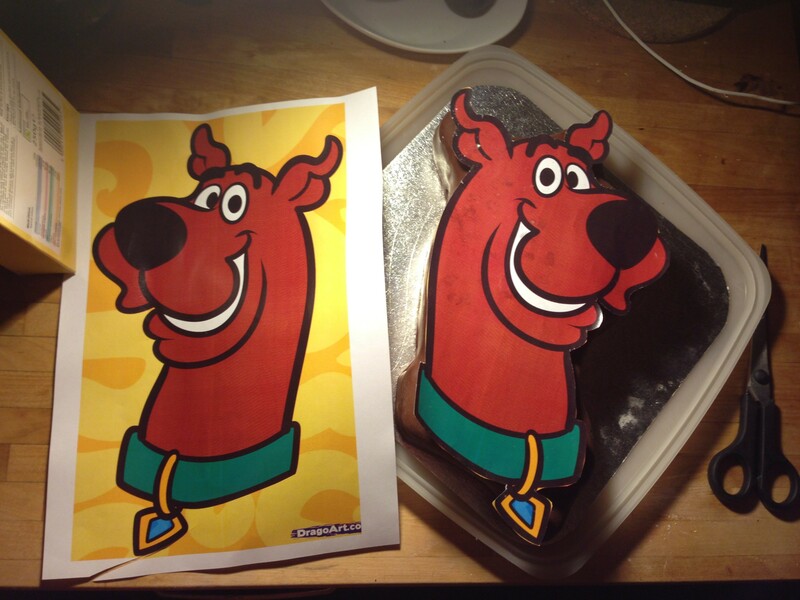 Again the template came in handy, as I could shape the fondant on top of the paper before sticking to the cake with a little edible glue. 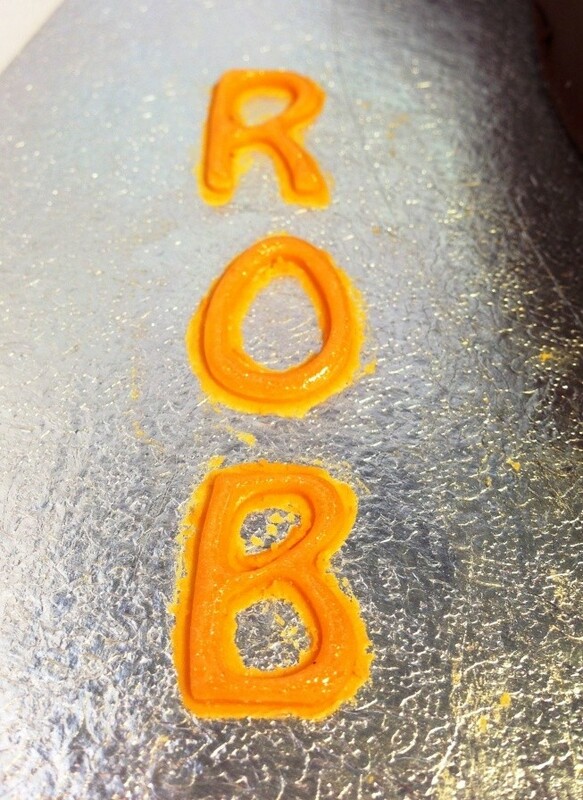 Finally, I wanted to add Rob’s name for the cake. My letter stencils really aren’t great at making free-form letters, they never come out of the mould! So, I tried a different approach – very lightly wetting the cake board in a small area, and laying a strip of fondant over the top. 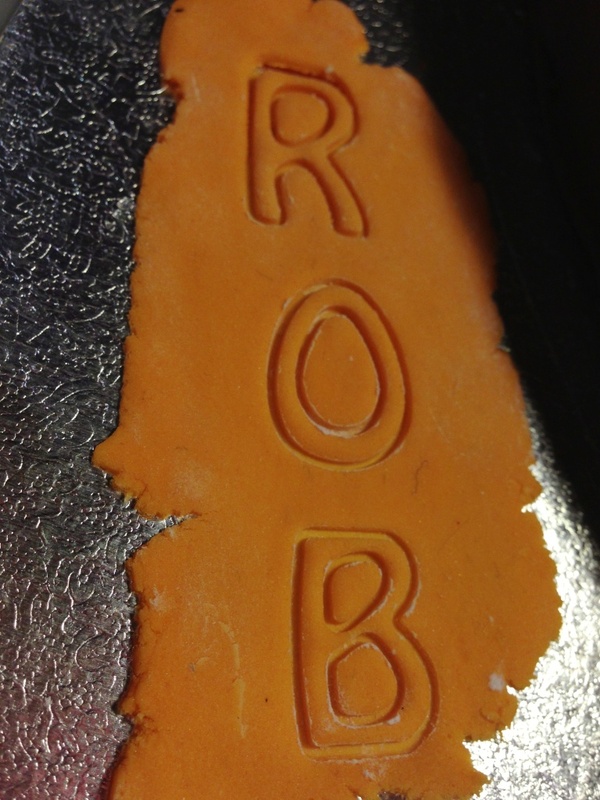 I dipped and brushed the letters well with corn flour, before pressing them very firmly into the fondant. Then, very carefully, I peeled away the excess and the inside of the letters (does he have the most difficult letters in his name or what! ), finishing with a teensy bit of glitter. And tada! 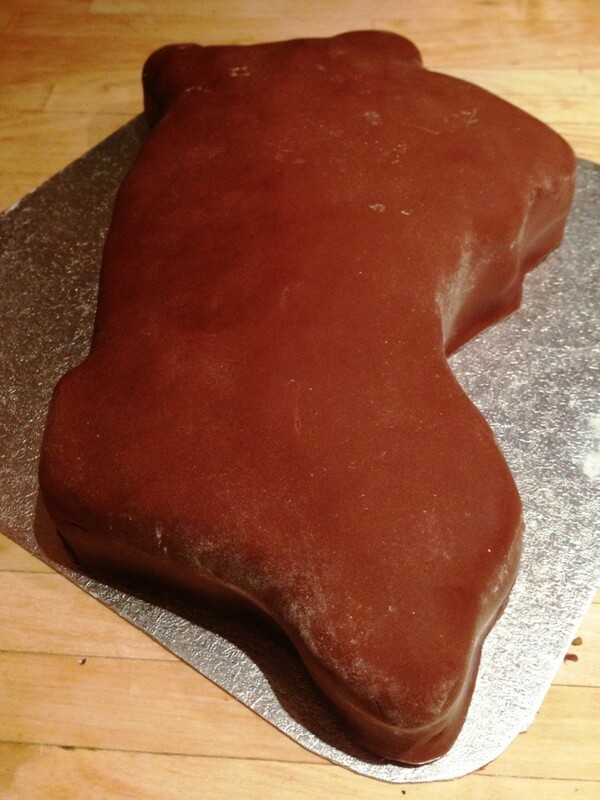 The finished cake! 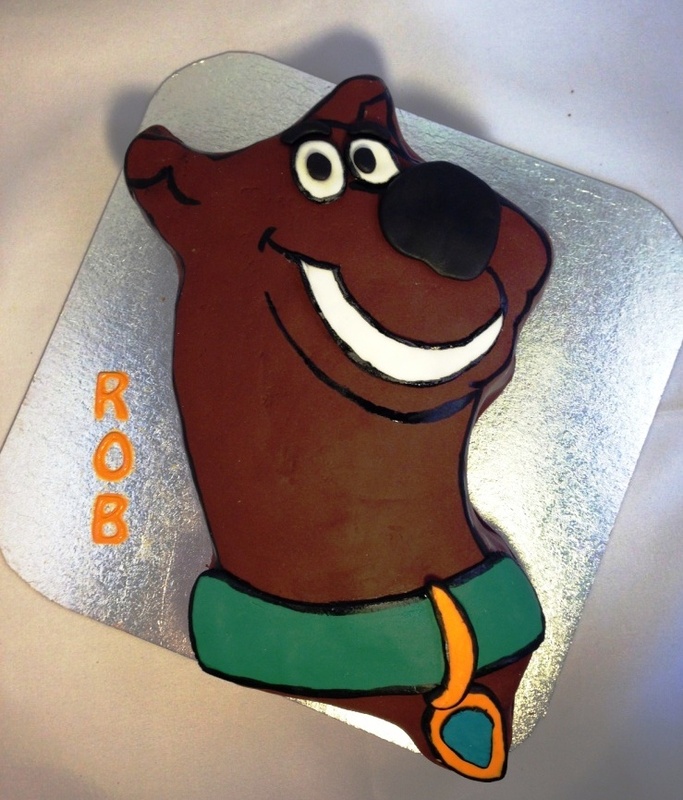 It was a complete surprise to Rob so I kept the candles just on the collar, so as not to ruin Scooby Doo’s face before he saw it. 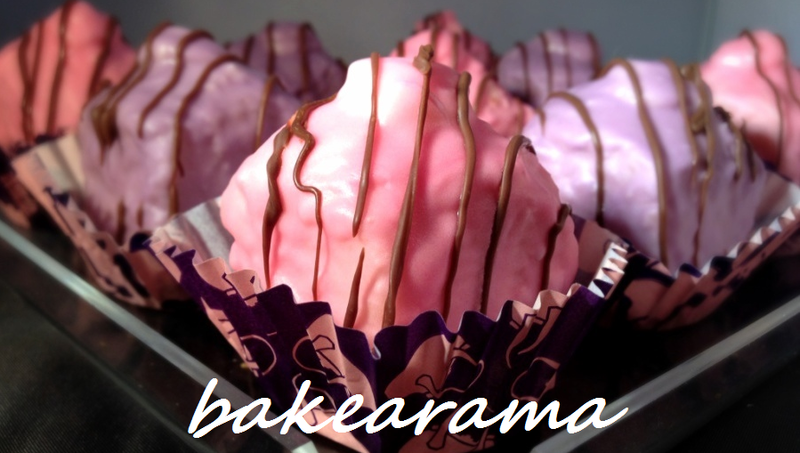 This entry was posted in Baking, Birthday Cakes, Chocolate, Theme / novelty cakes and tagged baking, birthday cake, cakes, chocolate, fondant work, occasions by bakearama. Bookmark the permalink. Very impressive. No offense, but I would’ve been just as happy with the trimmings from the chocolate pound cake! Yummy. Happy Birthday to your lucky husband! If I could ship them across to you Sheila I happily would…! hi. How do i get that template? thx. Hi Marion, I just found the picture on google image search and printed it to the right size for my tin.